The domain within your query sequence starts at position 23 and ends at position 102; the E-value for the MANEC domain shown below is 2e-44. The MANEC domain was formerly called MANSC. This domain, comprising 8 conserved cysteines, is found in the N terminus of higher multicellular animal membrane and extracellular proteins. It is postulated that this domain may play a role in the formation of protein complexes involving various protease activators and inhibitors. It is possible that some of the cysteine residues in the MANSC domain form structurally important disulfide bridges. All of the MANSC-containing proteins contain predicted transmembrane regions and signal peptides. It has been proposed that the MANSC domain in HAI-1 might function through binding with hepatocyte growth factor activator and matriptase. The MANSC (motif at N terminus with seven cysteines) domain is a module with a well-conserved seven cysteine motif that is present at the N terminus of higher multicellular animal membrane and extracellular proteins. It is possible that some of the cysteine residues in the MANSC domain form structurally important disulphide bridges. All of the MANSC-containing proteins contain predicted transmembrane regions and signal peptides. It has been proposed that the MANSC domain in HAI-1 might function through binding with hepatocyte growth factor activator and matriptase [(PUBMED:15124631)]. There are 1339 MANEC domains in 1296 proteins in SMART's nrdb database. Taxonomic distribution of proteins containing MANEC domain. This tree includes only several representative species. The complete taxonomic breakdown of all proteins with MANEC domain is also avaliable. Click on the protein counts, or double click on taxonomic names to display all proteins containing MANEC domain in the selected taxonomic class. 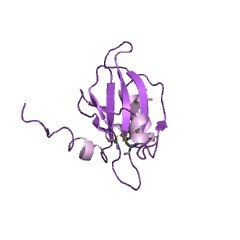 MANSC: a seven-cysteine-containing domain present in animal membrane and extracellular proteins.